I sometimes use DJ Doena's excellent program CastCrew Edit 2 in order to screenscrape credits from IMDb. And as all you Profiler users know (I hope) you cannot contribute data copied from IMDb to Invelos database. But you can use it as a strarting point. If you do, you must verify the data against the actual screen credits. With cast, that is usually not all that difficult. It can be when it comes to crew. Crew credits are spread all over, and while you can verify that what you see on screen matches what you copied from IMDb, it's not always easy to make sure that there isn't a credit in the IMDb data that is not actually in the screen credits. You'd want to have a check list where you can check off the credits as you see them on screen. This is where CastCrewCheck comes in. It gives you a list of the credits that are in your profile. You can keep it on screen while you roll the movie credits on your computer. Click "On Top" and it stays above your player software. If you can find a spot where it doesn't obscure any credits, fine. But often the credits are all over the place, so you can click "Translucent" and the program will be semitransparent so you can see the credits through it. If you spot a credit that doesn't match, you can edit it. Any changed text will turn bold so it's easy to spot when your done. You can check the checkboxes as you verify the different credits, and thus if there are any unchecked boxes when you're done, these credits need to be removed (or possibly, in case of Cast, be flagged as uncredited). Names with a pink background are "Credited as", and they are shown rather than the common name, since this is the name you are expected to see onscreen. If you hover the mouse pointer above the textbox, you'll see a popup with the associated common name. In case you spot an onscreen credit that is missing in your profile, you can make a note of it in the Notes tab. And when you're done, just make the necessary changes to the profile and you're good to contribute it. 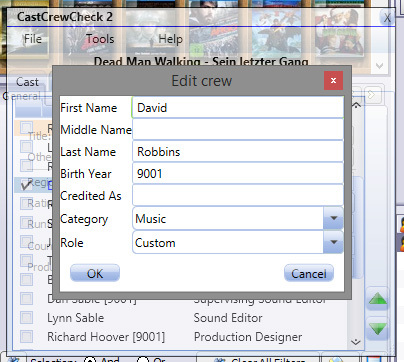 * When I add a new movie to DVD Profiler, it would be great to simply paste the exports of DJ Doena's CastCrew Edit 2 into the program. * Right now, there's no way to export the corrected data, is there?! So, I'll have to manually re-enter my edits in DVD Profiler which doubles the work. 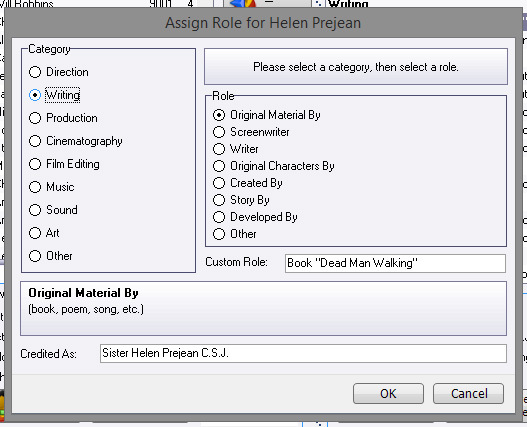 * If you're adding an export function, you'll also need to add a way to edit common and credited-as names. * There's no way to re-order the entries to get the correct on-screen-order. There's also a bug, that will crash the program when right-clicking outside the data-table. Well, I really only thought of this program as sort of a smarter notepad. Yes, you have to manually re-enter the edits, but I don't think that it usually is that much that you have to correct. At this time, re-ordering the entries is the only addition that I am contemplating. Since StaNDardD's request sounded interesting, I gave it some further thought. There are, unfortunately, some problems with it. The way it's done now, for cast you get a single name field, with "(voice)" and "(uncredited)" appended when needed, plus a role field. In order to handle things the way requested, there would have to be separate columns for first name, middle name, last name, credited-as name, voice, uncredited, and role. While that's perfectly possible, it would mean a much wider window. 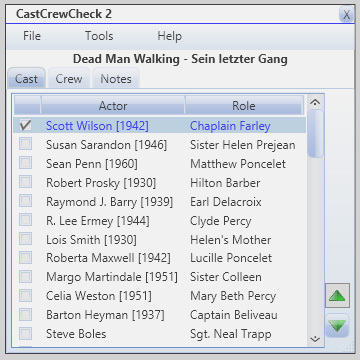 The whole point with CastCrewCheck is to keep the window to a minimun so it doesn't obscure the credits any more than absolutely necessary. So I see no point in rewriting CastCrewCheck to acommodate this request, I'm afraid. Just wanted you to know that I did consider it. I said that I wouldn't implement copy/paste in CastCrewCheck, but of course I was hit with "The Developer's Curse". That is, when someone puts an idea in one's head, that idea gets a life of it's own and suddenly it makes one go "Wait a minute - I know how I can do that". So that made me rewrite CastCrewCheck. The new version supports copy/paste as suggested. In order to keep the main window small, it looks pretty much like the old one, but you double-click an entry to edit it, and a small edit window opens up. 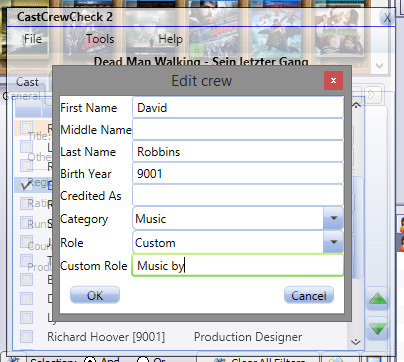 It also supports reordering cast and crew. Normally only checked items get copied, but there is a setting that can override that. It supports dividers, and you can add / delete entries (even though delete is strictly speaking not necessary, but some might prefer it). I discovered I had missed a bug with dividers in copy cast / crew. Also fixed a small bug that caused an exception when you clicked the down arrow with no item selected. I had some problems with Avast thinking the program was infected, but I think it's ok now. Let me know if you have any problems. Added "Clear All Roles" to the context menu for cast. This is in case the film you are reviewing does not have any end credits, and you want to remove all roles in order to either leave them blank, or research other sources for them. 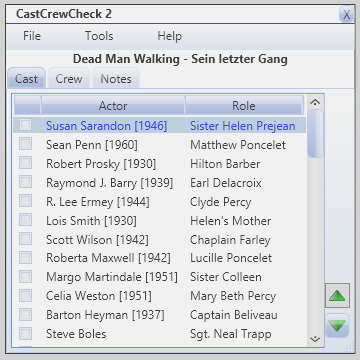 Also fixed a bug that cause a null exception when adding new crew members, and reworked the look for dividers again. I'm back at home and just took a quick look at the new version. It look really great, thanks a lot for the improvements. Can you make the tool remember the window positions? Especially the "Edit cast" / "Edit crew" windows would be great. It would be good enough if they remember their position only per session or will be centered above the main window. Main window remembers position between sessions. Edit windows open center owner first time opened in a session, then remembers position when OK clicked (but not when Cancel is clicked). Also, there is a new menu option to set the opacity. It is only enabled when Translucent is checked in the menu. Opacity can be set from 20% to 90%, and is remembered between sessions. - Added a theme to make it look more attractive. - Fixed so that list headers don't scroll out of view. - When new members/dividers added, scroll them into view and make them selected. - For Cast, the up button is now repeating when you hold it down for more than 1 second, but only repeats until the selected item has reached the first checked item. The idea here is that when you add a cast member you probably want to move it up to where you were checking off the cast, so after you OK the cast edit window you only have to press the up button and keep it pressed to move to new entry up to its intended position. 1. 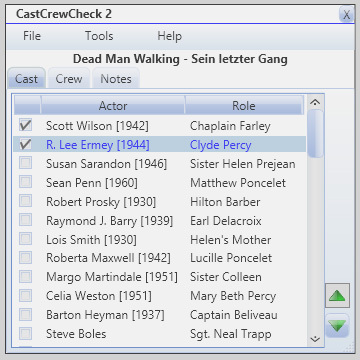 Checking a cast / crew member might select the row, so I can directly move the line up/down without the need of an extra click on that row. It would be better to have this line visible all the time, but only accessible when "custom" is selected in the drop-down menu. Those are all good suggestions. Thanks! I'll take a look at them. Let me know if it works the way you meant. These are implemented for cast only. Have you done this on purpose? On cast these are working as expected. The move-up-button on cast is not themed.